Round 4: Acura Grand Prix of Long Beach, 12-14 April. 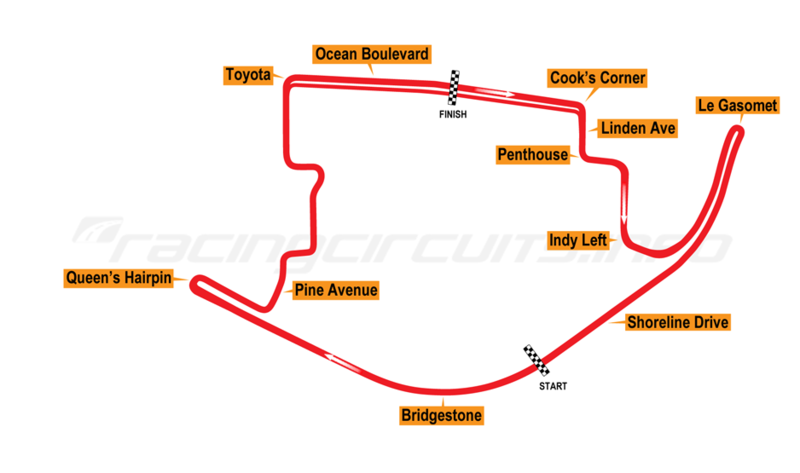 This year's race will be the 45th running of the Grand Prix of Long Beach and the 36th consecutive year the race has been held as an IndyCar event. It is the oldest running street race in North America and was founded by local travel agent Chris Pook in 1975. The inaugural race was the 7th round of the SCCA Formula 5000 series, held on September 28th 1975 and was won by British driver Brian Redman, in a Lola T332-Chevrolet V8. Following the success of the F5000 event and only 6 months later Pook convinced FISA to hold the F1 United States Grand Prix West, which was was won by Swiss F1 veteran Clay Regazzoni, driving a Ferrari-312T. The United States Grand Prix West remained on the F1 calendar until 1983. Interestingly, it wasn't until 1980, that Toyota became the race sponsor. However, this year long term sponsors Toyota, will be conspicuous by their absence. After the 1983 Grand Prix, increasing F1 costs, sanctions and shipping charges, made the race too expensive to be run as an F1 Grand Prix. Having been approached by CART to host a race, Long Beach became a CART/Champ Car perenial event from 1984 to 2008. The final Champ Car race was held on April 20, 2008 as part of the 2008 IndyCar Series split weekend. Although series reunification took place in late February 2008, it emerged that there was a calendar clash between Long Beach and the IndyCar Series round at Motegi in Japan. 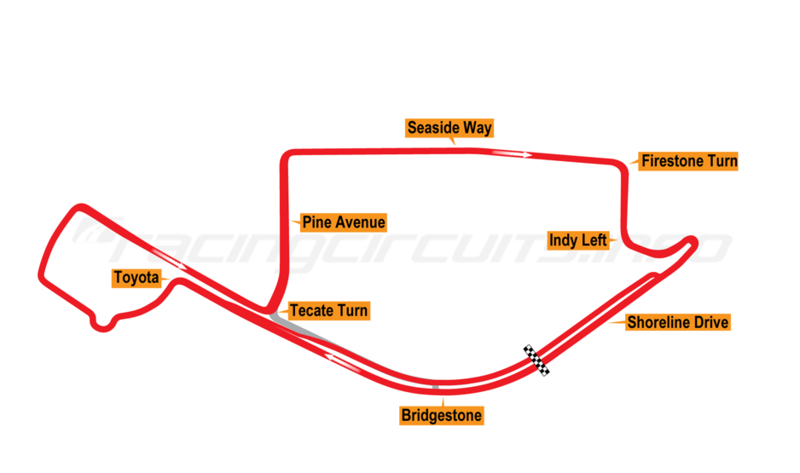 With both races so early on in the year and more or less finalised, neither track could change their date; particularly Long Beach, due to the preparations required for a street course. It was decided both races would go ahead, with points from Long Beach counting towards the the IndyCar Series championship. It was won by Will Power driving for KV Racing, in a Panoz DP01-Cosworth. The race became part of the IndyCar Series calendar the following year. Recently, there were rumours as to the future of the race. However, the Grand Prix Association, which owns and promotes the race and the City of Long Beach, signed a new three-year agreement after the 2015 race, with an additional two-year option. The driver with the most wins: 6. Al Unser Jr., 1988 - 1991, 1994, 1995. The team with the most wins: 6. Newman/Haas Racing. 1984, 1985, 1987, 2005, 2006, 2007. Chip Ganassi Racing. 1996, 1997, 1998, 1999, 2009, 2015. Team Penske 1993, 1994, 1995, 2001, 2012, 2016.
where all the variations over the years can be seen. Hélio Castroneves, April 8, 2017. 1:06.225, 106.980 Mph (172.167 Km/h). Pole sitter Alexander Rossi took a commanding lead, as Power made a poor start but recovered to claim second spot. Coming up fast on the outside, Graham Rahal nudged Simon Pagenaud and spining him into the wall. Rahal took the third spot but was now subject to a steward's inqiry and was given a drive-thru penalty. Meanwhile Hunter-Reay clipped Scott Dixon’s left-rear and under the following caution had to pit for a new front wing. The race order was Rossi, Power, Dixon, Josef Newgarden, James Hinchcliffe, Sebastien Bourdais, Robert Wickens, Tony Kanaan, Jordan King and Ed Jones. On Lap 7 Kanaan overtook Wickens, while up front, Rossi had pulled a 3.5 second lead on Power who had Dixon, Newgarden, Hinchcliffe and Bourdais stacked up behind him. Four laps later, Hinchcliffe made an error with push-to-pass, allowing Bourdais into fifth and dropping Hinchcliffe to ninth behind King. Hinchcliffe decided to switch to a three-stop strategy. Soon after Rahal and Jones had decided to do the same. Two laps later, Josef Newgarden became the first front-runner to pit. This cycle of stops allowed Hunter-Reay to switch to the primary tyre and make rapid progress up the order and into ninth spot by Lap 15 and moving into eighth on Lap 17 when Kanaan pitted. Hunter-Reay then passed rookie teammate Zach Veach, to take seventh and then rapidly closed on King. Up front, traffic helped Power stay within 3.5 seconds of Rossi and 1.5 ahead of Dixon, with Bourdais a similar distance behind Dixon. Rossi then made a very quick stop from his 3.5 second lead on Lap 25, that left Power, Dixon, Bourdais and King trying to nail some fast laps before the first of their two stops. King stopped on lap 28 but Power, despite approaching traffic and with a 2.5 second lead over Dixon, dropped to 1.5 seconds, staying out for an extra lap. Dixon and Bourdais both followed but Dixon got out ahead of Power on his out lap. Power was further demoted by the three-stopping Newgarden on warm tires. Rossi was now back in front with an 8 second lead over Dixon, followed by Newgarden, Power, Bourdais, Kanaan, Jones, Hunter-Reay, King and Hinchcliffe. Meanwhile Rahal made his third stop, his second for fuel and tires. Bourdais on the option tyre, dived up the inside of Power now on the primary tyre, to take fourth pace on lap 36 and repeated the move on Newgarden two laps later. Further back, Sato snatched eighth from King, while Newgarden made his second of three stops on Lap 39. By half-way, Dixon had cut Rossi’s lead down to 4 seconds but yellow flew as Kaiser had skated down the escape road in Turn 1 and needed a bump start. Kanaan had just committed to the pitlane in time, pitting from fifth and rejoining in 10th. With three lapped cars between himself and Dixon, Rossi had an easy restart on Lap 47 but further back there was drama, as Hunter-Reay got loose and was hit by Sato, leaving the Andretti Autosport car with a flat tire. Hunter-Reay pitted and dropped to 19th. The move of the race came on Lap 48. As Dixon struggled to pass one of the backmarkers, Bourdais passed both of them as well as Leist, who had been lapped, on the run into Turn 1. However, Bourdais was ordered by Race Control to give up second place to Dixon for encroaching the end of the pitlane exit, which he did and then promptly passed Dixon for a second time. This left Bourdais 7 seconds behind leader Rossi. Andretti Autosport team manager, Rob Edwards decided to take advantage of the situation and call Rossi in on Lap 56, where he also took a half turn of front wing. Yellow flew again, when Zachary Claman De Melo hit the wall. Both Bourdais and Dixon pitted, though according to Race Control after the pits had closed . Ganassi decided to service Dixon's car, while Coyne sent Bourdais through to return to the pits once they were open. When they did open, Newgarden led the charge of the remaining three-stoppers, with Kanaan, the ‘re-pitting’ Bourdais, Hinchcliffe and Jack Harvey in pursuit. Under the yellow, King’s strong run ended, in desperate need of having his brakes bled. The race resumed on Lap 66, with Rossi leading Dixon, Power, Jones, Veach, Andretti, Rahal, Kimball, Newgarden and Kanaan. However, Dixon received a drive-thru penalty for pitting when pitlane was closed, which he served on Lap 68. With 17 laps to go and Dixon out of his way, Power had a 2.4 second gap to try and close on Rossi. At the hairpin on Lap 71, King dived inside Hinchcliffe, tagged Bourdais and spun him broadside, blocking the track for those immediately behind, including Wickens and Hunter-Reay. Bourdais pitted for a new front wing. With 15 laps to go, the lapped cars were cycled to the back of the field, theoretically giving Jones a chance to have a go at Power. However, when the green flag flew with 9 laps to go, Jones was having to defend hard from Veach. Further back Newgarden passed Kanaan again, after losing out on the restart. Power gave it everything over the final laps, leaning on his push to pass but Rossi did likewise and was always able to keep the Penske driver at bay, eventually crossing the line to win by 1.24 seconds. The pair of them had pulled over eight seconds clear of Jones, who nonetheless clung on, to match his best ever finish with third place and his first podium for Ganassi. It was the third IndyCar race victory for Rossi, in his third season and the 58th for Andretti Autosport. Alexander Rossi, 1:06.5528, 106.454 Mph (171.321 Km/h). Race Broadcast: NBCSN. April 14, 4:00pm ET. I'll be there on Saturday and Sunday. Just hope it won't be so windy, there has been a gusting wind since yesterday all over the LA basin. Temperatures are fine, though..low to mid-70's with clear skies. Bourdais is going to have a busy weekend as he is subbing for Joey Hand in Ganassi's Ford GT in the IMSA race. I am impressed that Coyne apparently views it as no big thing. Alexander Rossi claimed his second pole in a row at Long Beach, while Penske got all three drivers into the fast 6, with Will Power in the top Chevy. There were 2 Red flags. First by Felix Rosenqvist, which put him down to 12th on the grid. This meant, Ryan Hunter-Reay, Patricio O'Ward, and Colton Herta, were unable to complete final fast runs. The second was by Tony Kanaan, who starts 21st. This cost James Hinchcliffe, Ed Jones and Marcus Ericsson the chance to improve on their previous best times and they will start towards the back of the grid. Moro photos coming up tomorrow! A very clean start, with Rossi getting the Jump, but it's the first FCY, as it looks like Pigot ran into the back of Veach, who ran into Harvey, at the fountain. That was a bad stop for Bourdais. Looked like trouble with the front right. Not too sure what was going on with Power. Something about a missfire, going into the hairpin, then briefly having to go down the escape road, with Dixon breathing down his neck.